There was an article in this weekend's Makor Rishon. It was about fulfilling the mitzvah of Korban Pesach, the Passover sacrifice, in this day and age. The article went through the Halachot and obligations. It is a unique mitzvah in that it terms of Taharot, you don't need to do more than dip in the Mikvah. At the end of the article was a telephone number, and the cost to participate (NIS 12) to get your piece of the Korban. While I already have plans for this Pesach that put me outside of Jerusalem on the first day, I started making plans with my wife and how we'll be in Jerusalem next year and fulfill this mitzvah. Anyway... a friend and I called up the number (Israel: 1-800-800-455). He was more subdued about it, because he figured it was a gimmick. We talked to them. It turns out it was Machon HaMikdash. The article was an "As if" article, describing the process and how it will be fulfilled. But unfortunately, they were not sacrificing a Korban Pesach this year, and no we couldn't join a group, and there was no piece of the meat we would get to eat in Jerusalem during the Seder. 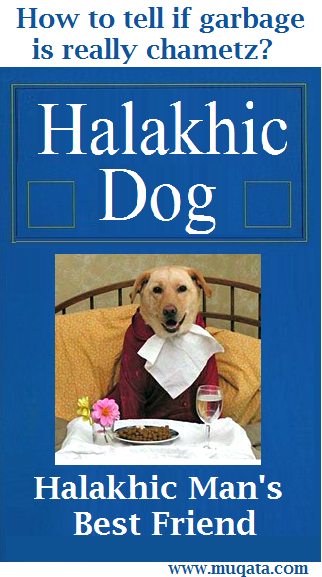 Halakhik Dog: How to Tell if Garbage is Chametz? Best Decsion this Year by UN: Gaza Marathon Cancelled! A UN aid agency has canceled the marathon in Gaza following a ban on women runners imposed by the territory's militant Islamic Hamas rulers. 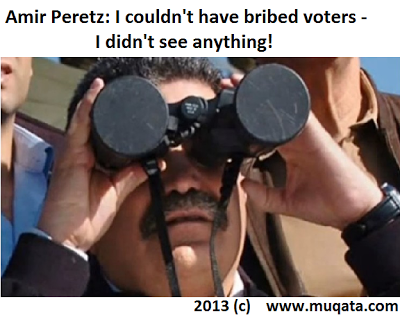 On IDF radio this morning, MK Shelli Yahimovitch accused MK Amir Peretz of voter fraud. Amir Peretz's office denied the report and said it "The publication of this pains me and is baseless." Obviously he had nothing to do with voter fraud -- he couldn't have seen it if it were in front of his own face. An Israeli "national religious" girls high school (Ulpana) fired a teacher who was pregnant...and single. This headline has been floating around the web yesterday, especially in light that the teacher sued the school in court for damages, specifically for having broken the law which prevents women from being fired if they are pregnant. When an Ulpana expects their teachers to be more than educators, but also role models for their students, did the school do the right thing even though they broke the law? 1. The teacher is religious, and observes a religious lifestyle in school and outside of it. 2. The teacher was 41 years old and single. 3. Not finding a husband by her age of 41, the teacher decided to undego artificial impregnation so she could have a child and she would raise the child as a single parent. The plaintiff's lawyer stated that the Ulpana should have taken into account her unique situation of being a single, religious teacher who wanted to have a child before she would be biologically unable to. The court does not make light of the defendant's right to determine their school policy, but the right of the defendant is less than than the right of plaintiff, and doesn't justify terminating the plaintiff's employment while violating her right to parenthood. The court awarded 180,000 NIS in damages to the teacher, which is a rather expensive lesson in democracy and "freedom of eployment" to the Ulpana. In my opinion, if the Ulpana truly wanted to act as a role model for their students, they should not have fired their teacher. I don't see how any coalition that forms at this point could possibly survive. During the election campaign, Likud and Shas acted horribly towards HaBayit HaYehudi and Naftali Bennett, and things didn't improve afterwards either. And besides the Bennett and Lapid pact, no one trusts one another at all. And if you listen to the politicians, you can really feel that palpable hatred and mistrust, especially coming from certain Chareidi politicians. There are Chareidi politicians who are going so far as openly threatening to help destroy settlements just to get even (which in their anger and hatred, they forget includes ten of thousands of Chareidim also living in settlements). What's even more absurd is that much of the Chareidi street no longer agrees with their political leaders. Yes, there is that hard-core that would definitely sit in jail for years, rather than go to the army, get a job, and support their families, but much of the Chareidi world is opening up to the idea that there is no shame in working for a living, while still learning Torah. Last week, I had the opportunity to speak with a Chareidi soldier currently in the Shachar (Air Force) program. He told me the program wasn't exactly like they described in brochure (so to speak). There were and are a lot of problems that needed fixing in order for the environment be more kosher for Chareidim, and he's not happy with the job he got stuck with. But on the other hand, in another year or so he's free to do what he wants, whether it will be to get a job, or sit in Yeshiva and learn forever. What was interesting, is that nearly all the other Chareidim in the room had also done army service to one degree or another, and all were working, and all had Chavrusahs. In fact, there was a Siyum Masechet going on at the time for one them, and this week, another will be doing his Siyum. So despite serving in the army, and despite working for a living, these Chareidim were still voluntarily learning and living a completely Chareidi lifestyle. Are there problems with the army programs for Chareidim? You bet there are. But the biggest problem is that there aren't enough Chareidim in the army to make a difference and fix it. How can you really expect a non-religious soldier to create a totally kosher environment when he hasn't the faintest clue what that even means? If there were more Chareidim in the army, they would be able to ensure that the environment met their needs, because they actually understand what those needs are. You can't force a society to change overnight. You can't throw an entire sector in jail (they tried that during the Disengagement, and it doesn't work). But the reality is that most Chareidim want to join Israeli society and share in the national burden, but Israeli society must also be prepared for the changes that will be demanded of it too for that to happen, and for that to work. And I don't think Israeli society is ready for that either. But those changes will be good for everyone. But they need to be introduced at the right pace. But going back to the politicians, if we take them all at their word, I don't see how this coalition will not evolve into everyone doing their best to hurt one another until the collape, and that eventually includes even Lapid and Bennett. Israeli society may be healing and working to repair the rifts, but the politicians? At this point I'm having trouble seeing that happen. Israel might need to roll the proverbial dice again and go for new elections, because this atmosphere is simply to poisoned.